In Rojava also referred to as Syrian Kurdistan there is an emerging movement which goes by the name of 'democratic confederalism' it has been embraced by the PYD (Democratic Union Party). They claim Abdullah Öcalan to be their ideological leader - Öcalan is currently imprisoned for life in Turkey due to his role as the leader of the PKK- a communist organisation with a history of terrorist attacks orchestrated by its members. 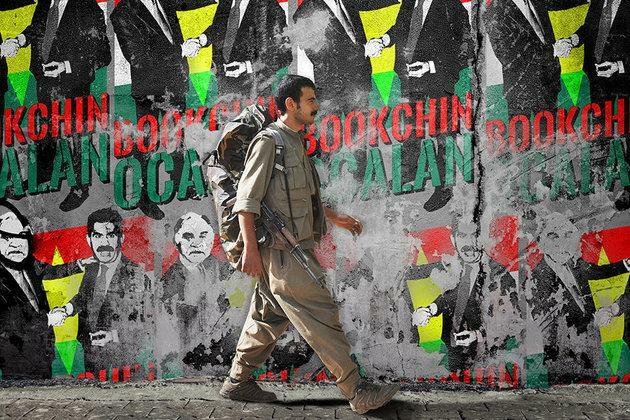 While in prison Öcalan studied the work of Murray Bookchin on the topic of social ecology – which presents a vision for a decentralised democratic society based on an economy of co-operative businesses and collective farms instead of infinite growth. Via Öcalan these ideas have come to influence the PYD in Rojava - who emerged as a more tolerable (and tolerant) version of the PKK - think of Sinn Fein emerging as the more establishment friendly child of the IRA. Since the outbreak of the Syrian civil war the PYD are leading the fight against ISIS. The society they are building in the midst of the war is multicultural - allowing the various ethnic and religious groups of that region to live together as free and equal citizens. Murray Bookchin began his activism as a communist but he was gradually drawn to anarchism due to the tendency of communist societies to become totalitarian police-states. Anarchism enabled Bookchin to carry a twin critique of the state and the market but unlike say Noam Chomsky who deals predominantly with such criticisms Bookchin was more engaged in painting a picture of what a better political system would look like. The key idea of Bookchin was the need for decentralisation to the municipal level – he called this Libertarian Municipalism – the PYD call this democratic confederalsim. The Lebanese philosopher Nassim Taleb a contemporary critic of centralisation emphasises that in a globalized world, municipal rule is key. Taleb refers to the progress of Beirut Madinati - a political movement advocating decentralisation as a means of tackling the corruption of the political establishment in that city. In the UK E.F. Schumacher through his book 'Small is Beautiful: A Guide to Economics as if People Mattered' played a great part in paving the way for the 'Transition Town' movement. Like Schumacher, Bookchin acknowledges the limits to economic growth on a finite planet and seeks to take the power back to the grassroots level to enable a more direct and participatory form of democracy which aims to make both social justice and environmental justice equally obtainable goals. war, he was very positive about the Bookchin inspired movement forming there, few other places in the Middle East share such a democratic outlook and the levels of religious tolerance, gender equality and the levels of unity amongst diverse ethnic groups is unmatched. It is disappointing but perhaps unsurprising that Sky One as a branch of the Murdoch empire edited out much of what Ross Kemp had to say about this progressive force in Syrian Kurdistan (Rojava). As with all political systems we should be wary to think that 'democratic confederalism' is perfect, or that it is a one-size fits all solution. Nevertheless to its credit we should see it as a system designed with an understanding of the limits of economic growth and the dangers of centralised governance. Murray Bookchin's primary fear was ecological fascism - if we continue to use up our finite resources at this rate the measures taken by government's to deal with these crises will result in oppression of citizens on a huge scale. If we wish to sustain the earth and our freedom upon it on it then we can do far worse than to look to Bookchin's message for inspiration and guidance. Born and raised in the Bronx as the son of Russian- Jewish immigrants it seems only right that we honour him as a true EcoHustler.